Pole sheds are useful for those who do have a farm or for any purpose that is agricultural in nature. The process of building ones does not need an expert to do so. You too can do it yourself, all it takes is basic carpentry skills and off you go. Choose a location which is level plus it does not get flooded when there is rain. Visualize your pole shed. Put your visualization into paper. Make a sketch out of it. This will make you see how your shed will looks like and put on some changes every now and then, if you find it necessary to add up a detail or two. Adhere to the local law about building or construction. It might look just a simple shed but you must follow what the law says when it comes to constructing one. Therefore, before you even proceed on putting up a shed and be in action, go seekfor building permit. Dig up some holes. This will serve well for your posts. The number of holes should correspond to the number of posts you are going to use. Use an auger or a hole digger to create the holes. The size of the holes must bigger than the posts. Put a gravel base with a measurement of 1-2 inches right at the bottom and then you can set up your pole. This will eventually aid you when it comes to drainage. Get concrete and start filling up the hole. This will aid your post from accumulating or getting moisture coming from the ground. If you are experiencing winter season, this will keep your posts from freezing. Form a brace with the use of 2×4 lumber. You need to brace the pole in order to be in an upright position to have the concrete to set in. With the use of roof trusses, you can start building the roof. 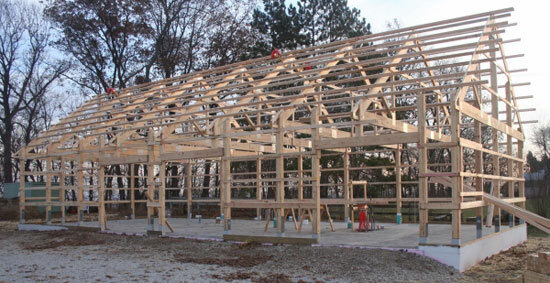 The size the trusses will solely depend upon on how big your shed is. Lastly, using the roofing nails (screw-in), you put the tin right on the roof. Be sure that the sections are overlapping. As to the final step, on top of the shed’s roof place something to keep it steady such as ridge cap.